Lee Spalding named another unchanged starting line-up as Supermarine continued their charge up the Southern League Premier South at Earlsmead Saturday afternoon with another excellent team display, winning by three goals to one thanks to early goals from Henry Spalding and Mat Liddiard and a second half strike from the divisions top scorer, Conor McDonagh. The only change came on the bench where Matt Coupe took the place of Joe Selman who missed the trip through illness. Elsewhere in the squad Zak Westlake moved across to Shrivenham on loan to get himself some game time. 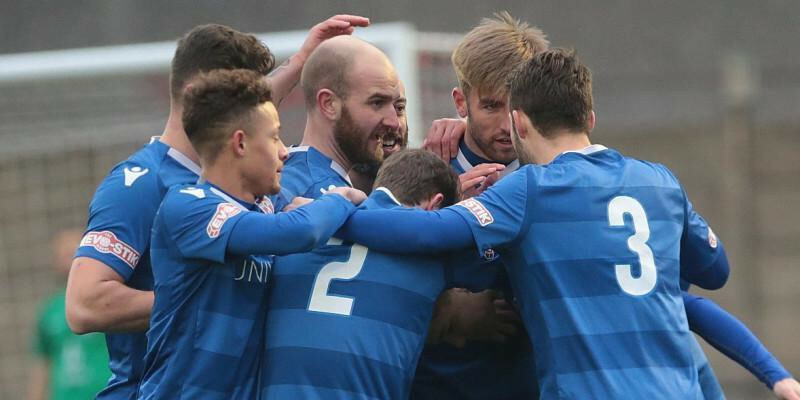 Harrow came into the game in mixed form, having won three and lost three of their last six with this being their 3rd defeat in a row, whilst Supermarine who won their last two, losing only once in their last six, made it three in a row and three in a week. The away side couldn’t have got off to a better when Jamie Edge played the ball out to Henry Spalding near the half way line and as he advanced on goal with defenders backing off, he looked up and hit a fierce shot from fully 25 yards which took a slight deflection, catching Hafed Al-Droubi completely flat-footed as he watched the ball nestle in the back of his net off his right hand post. Boro should have equalised shortly after but Shaun Preddie headed over the bar from a corner when well placed six-yards out. With twenty minutes on the clock, Conor McDonagh won a corner after breaking the offside trap which was headed behind by George Fenton. Connor Thompson, making his 100th start for the club, swung in the corner kick and despite being tightly marked, Liddiard beat his defender to the ball to power home his header to make it 2-0. Boro’s top scorer Dylan Kearney fired an effort high over the bar and Michael Bryan curled just over the bar from 20 yards, although it looked like Will Henry would have had it covered had it been on target. McDonagh could have added to his tally on the half hour mark but Al-Droubi parried his fierce effort behind for a corner. Kearney was unlucky to not pull the home side back into it when his sliding effort at the far post hit Thompson and was diverted out for a corner by a fine low save from Henry who recovered his position well to get down to the ball. Marine came out all guns blazing after half time once again and Preddie almost diverted Ryan Campbell’s cross into his own net, just clearing his own crossbar. After a heavy spell of midfield action McDonagh added the third goal when Spalding pounced on some poor defensive play by the hosts and played a first time ball through to the striker who took a touch to steady himself and hit his effort into the net between the keepers legs to put the game out of sight. The third goal prompted a triple substitution from the home manager as Kearney, Mark McLeod and Lewis Cole all made way for Ant O’Connor, Frank Keita and Max Holland and following Matt Williams seeing his header saved on the line by Al-Droubi, the Harrow substitution paid dividends when Keita blasted home from near the penalty spot following a deflected pull-back from fellow sub, Holland. Spalding’s men tried to hit back instantly and Campbell saw his curling effort fall just wide which other than a couple of half chances for either side, was the last really good chance for both teams. Following the game Lee Spalding said He said: “We started the game really brightly and scored a really good goal early on. “We added another before half-time and then when the lads came in, we just told them to keep on doing what they had been doing. “We knew Harrow would come out and offer a reaction off the back of their first-half performance, but I thought we played some of our best football of the season in the first half. “And for a quarter-of-an-hour of the second half, I thought we were outstanding. “We had countless opportunities to make it four and five, but I think the real character of this side is starting to come through and the players really want to win every game. “At the moment, we’re in good form and it’s important that we continue that into next weekend.” In the days leading up to Marine’s win, Spalding said he wanted his side to keep more clean sheets as his attacking players would not always be on hand to bail them out.And despite being pleased with the resounding win, the Marine chief was left disappointed as his side failed to keep a clean sheet once again. ’Marine will look to keep up their superb run of form of going at home next Saturday versus relegation threatened Frome Town.